In every large group or organization, the individuals involved never quite actualize the professed ideals. Visitors to an urban courtroom, for example, are shocked to discover that often neither judges, attorneys, nor even the police seem to have an operative interest in truth being served. Though lives may be hanging in the balance, professional bureaucrats robotically fulfill their tasks, cooperating with each other to expedite matters quickly and efficiently–far from exemplifying fairness on display. And in many similar settings, the individuals involved may have personal motives and agendas that conflict with their professed ideology. Though they may identify with certain groups or values, they do not necessarily observe these beliefs as strict guidelines for life. In our own communities, though a majority of our youth do conform to observable standards and remain loyal to Orthodox practice, when this behavior merely follows accepted norms, an ostensibly halakhic and religious life becomes an insincere, pro-forma ritual, that is at times inconsistent, and often devoid of holiness and purpose. In recent years, varied community leaders, aware of a spiritual malaise, have suggested specific improvements – let us strengthen Modern Orthodox ideology: design a curriculum; teach our youth the tenets of our beliefs; and they are bound to live up to our expectations. But this assumption – that student loyalties would be guaranteed if they would merely adopt our beliefs – is incorrect: individual decisions are rarely guided by ideology. Further, even were we to win our youth over intellectually and convince them of the validity of our hashkafot, if we are oblivious to the real lives of our students and unaware of the tests and tribulations they face on a daily basis, we are bound to provide inadequate instructions. Rather, to reach our students and have an impact, we must first be able to influence their decision-making process. True individual dilemmas are not decided by gauging utilitarian benefit, nor are they resolved by social and ideological loyalties, though these factors may provide a measure of motivation. Individuals are conflicted by the competing urges that our tradition calls the lifelong struggle between the yetzer ha-tov and the yetzer ha-ra, and a person’s true inner self is actualized only through bechirah – by recognizing the nature of temptation, separating this from his own deep-rooted will, and learning to confront the forces within. These conflicts are internal – within a person’s heart. What bothers young people most is not ignorance of the answers to Hashkafa questions, or understanding the rules which govern their behavior, though these are certainly important. Rather, their lives are defined by the need to choose between attractive alternatives, and the personal sacrifice this often entails. As a young person furthers his connection to G-d, he becomes sensitive to these ongoing choices, but it is only to the extent that his Torah is real – acquired in his heart – that he can truly be faithful to its perspective. How can we assure that our youth acquire Torah in their heart? What is truly vital is that we guide our students to appreciate the uniqueness of Torah; and that they recognize how it differs from any other subject like physics, biology, history or mathematics. Torah is not a section of the curriculum, or a specialized course of study. In brief, Torah is not mere information, and certainly not ideology. Torah is not part of the physical world, though it provides us with rules that command demonstrably different behavior from the rest of the world. Somehow, our teens must realize that Torah is life itself, unlimited, immutable and eternal. It is not merely a part of existence, it is existence, and it defines reality on its own terms. It is only through toil and diligence that a young man or woman can catch a glimpse of this unique perspective and acquire his or her own portion of Torah. Hence, Torah cannot be taught with the same methodology used to impart other value systems. For not only are our rules and regulations different, but the very nature of Torah thought functions on a different plane, and for this reason, the method of transmitting Torah is distinctive and unique. This is puzzling: Is the basis of our faith the fact that fathers never transmit falsehood to their children? Is that valid evidence? Do we deny that fathers sometimes, but not always, teach their children irrational ideas? How can trust in our fathers serve as the ideal foundation of belief? Why is this more effective than witnessing miraculous signs from Heaven? In high school, to my sorrow, though there was a focus on learning, I must say that I and all those around me keenly felt that the atmosphere was one of competition to achieve in general studies. We learned, but it was purely by coincidence. It had no real meaning… The values that I did pick up were: the extreme importance of “doing well,” of attaining a successful career and of being pro-Israel…..Judaism was mitzvat anashim melummadah. The speeches are all there, but the actions were not. How can our parents talk about talmud Torah when they don’t learn? How can they talk about being medakdek be-mitzvot when we saw them being careless? When we got to Israel, we found people who weren’t hypocrites. Who did what they said, and learned. Who made avodat ha-Shem their ikkar in life….Growing up we teach our children that talmud Torah is crucially important – but then we are not careful to make sure that they actively learn. We don’t mind if they spend endless time on TV, internet, and other things. Kids are VERY sensitive to these kinds of issues. You can not emphasize one thing in tefillah and classroom, but then let it go in ‘the real world’. This young man learned what his parents taught; only it was not so much the words they taught as the reality of their lives that impacted on him. In fact, this is always how we teach. Curriculum and lesson plans are just words, but a teacher does more – he teaches himself. This is even more true when the teacher is a father teaching his son, where the student is a physical extension of his teacher. The Sinai Revelation is the eternal Torah lesson. It was not merely an experiential event, and what remains with us from that day are not only the words, rules and instructions. The revelation was the transmission of life itself. All of creation hung in the balance, for reality was defined at that moment. To pass this on to the next generation is not only to validate the evidence of that experience, but to transmit the essence of life. This is what a father transmits to his children. Klal Yisrael, connected to the essence of existence, bequeaths that portion of life to its descendants. “A father does not give false testimony or transmit vanities to his children;”meaning: he extends and expands his own living truth, which reflects his own life and the life of every Jew, to the next generation. But if instead, his stated instructions are not consistent with his own behavior, and if he dedicates his own life to ephemeral materialistic pursuits, his children receive a different message. His Torah is not true. Many of our students see no practical benefit to Torah study, nor do they have a compelling reason to devote hours of their lengthy school day to analysis of obscure and esoteric texts. Attuned only to an educational system where academic proficiency garners acceptance to the college of choice and is a tool for professional success, they have not assimilated the idea that Torah study is different – it is Divine service for its own sake. When Torah is placed on a parallel footing with other subjects we teach, students will naturally measure which class is more valuable and pertinent, and cannot be blamed for underestimating the Torah’s significance. But, the Torah is not merely another subject. It is intellectual activity of a different sort. “The Torah is not found by merchants“ (Eiruvin 55A). The Maharal of Prague explains that merchants are involved in a constant give-and-take, weighing one option against another, and calculating their worth. But such is not the way of Torah. The Torah is above and beyond all challenge. Man cannot disregard the Torah’s word, not because it is prohibited, but because Torah is the source and definition of the very reality we live in. Torah cannot be measured against anything else, because the Torah is the singular basis of all existence. G-d is One and His Torah is One. The Torah is not merely a better option, with rules for healthy living. The Torah is illumination: ki ner mitzvah ve-Torah or (Mishlei 6:23). It is a brilliant flash of light that illuminates the world with understanding and comprehension, banishing the forces of darkness. Torah is a different perspective, and from its vantage point, man acquires the tools to confront a beckoning world. For this reason, at Har Sinai all the world was silent – in the light of Torah, no competition truly exists. The Torah is not a matter of choice. It is an all-encompassing state of being. Whenever Torah is studied, man recreates the Sinai experience, and it is the task of a Jewish school to introduce that lofty vision into the lives of the next generation. Acceptance of Torah is feasible only when the echo of Har Sinai is heard, and our students must recognize that they too have stood beneath that mountain. With all this in mind, let us now turn to our own educational system, and see where adjustments may be in order. The traditional Yeshiva’s focus on Talmud is criticized and often misunderstood. Talmud is not a subject but a way of life. In fact, a well-known practice in Yeshivot of old was to study for days on end, with the most diligent students persisting until they dropped from exhaustion. Not that this was sound advice, but, just as life has no interruption, and man breathes without a break, Torah is best studied in the same manner. No matter where he stands on the spectrum of Orthodoxy, a dedicated and devoted Rebbe will similarly inspire his students. An influential educator considers Torah to be his lifeblood – “Ki Hem Chayenu”. Only then will his Shiurim and lectures be enthusiastic and inspiring, and only then will his students sense the infusion of a higher source that resonates through the Torah that he transmits. The students must sense that their Rebbe is transmitting echoes of his own Rebbe, and in that transmission the sound of Sinai can still be discerned. He must contain more than he is giving over, and his students will detect something of the unlimited nature of Torah that is the Rebbe’s heart, and know that he is holding back much more, teaching them now only as much as they can understand. Today’s greater access to Torah through data base searches, or prepared texts available on file, will not automatically produce the kind of Jews that will ensure our dynamic future as a people. Torah cannot be mastered merely by careful textual analysis, nor can neophyte scholars chart new courses based upon their own readings of ancient texts. Torah and Halacha make reference to the text, but true Torah is shaped by the teachers and Gaonim of each generation, whose living Torah of sincerity, humility, piety and authenticity actualize and validate their approach. Which massekhet to study is a question of minor significance in traditional yeshivot. The purpose of Torah study is not merely to memorize the details of the four prototypes of damage, the three methods by which to betroth a woman, or the answer to any particular question, but the goal and purpose of Torah study is the connection to G-d that comes with dedicated and ongoing Torah contemplation. This is not to suggest that information is not important, or that the subject matter need not be mastered, but that Torah is transmitted in a different sort of way. In other words, it is possible for one to know the right information but to remain disengaged – devoid of true commitment. Torah is not defined by its text and the information it contains; rather, it is defined by what is contained in the heart and soul of the rebbe that he transmits to his own students. “How foolish are most people; they stand before a Torah scroll, but not before a Torah scholar!” (Makkot 22b). The rebbe is the true Torah. He must be a living example and embodiment of the Torah lessons that he teaches. He brings Torah to life and gives expression to a deeper reality. He transmits himself to his students, and to the extent that he faithfully reflects the Torah, he provides them with an alternative that they too can strive for. To do so, however, the educator/rebbe himself must be immersed in the intricacies of a difficult Talmudic problem before he presents it to others. If he has spent a complete evening attempting to decipher a difficult Tosafot, or find an answer to Rabbi Akiva Eiger’s question; if he has stayed awake while contemplating a philosophical dilemma, he will have no problem drawing his own students near. If on the other hand, he perfunctorily recites mimeographed lessons, and can demonstrate only that the Torah has interesting answers to relevant questions, his students will not be convinced of the Torah’s unique status and authority, and they will be no more enthused than he. Democratic principles are wonderful tools for a lively and engaging classroom experience, but they can never capture the true flavor of Torah mi-Sinai. The rebbe must be perceived as a divine messenger, presenting a binding and undeniable connection with G-d. He need not possess charisma or charm, and it should not be his magnetic personality that students find convincing; the compelling nature of Torah itself will guide his students to focus on the devar ha-Shem. The oft-stated suggestion to make Torah relevant by studying tractates with familiar observances such as Sukkah or Rosh HaShanah misses the point. 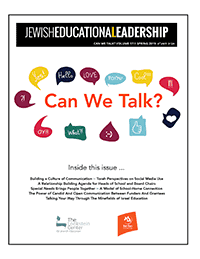 To show Torah’s relevance and vitality, we need simply to engage our students’ minds and peel away the layers that conceal the heart of each Talmudic discussion. This can be done best while studying Nashim and Nezikin, whose ready case law lends itself easily to sharp and riveting analysis that demands full and intense concentration. A captivated mind quickly discovers a universe of subtle detail, and this is more effective–and more relevant–than the highly touted method of tracing a particular Halakhah from beginning to end. This can not take place solely in the classroom. Many of our students spend years in the classroom, but have yet to study Torah on their own accord, accomplishing little more than attaining the information they need for the next exam. In many schools, the classroom framework serves both Torah and secular studies, with students shuttling to and fro from one course to the next. This setting may be conducive for studying information, but is not ideal for talmud Torah, which is presented best in the traditional beit midrash learning ‘seder’, a self-contained dimension of learning without end – no interruptions, no distractions, and no breaks, where students are bound neither by lesson plans, subject matter or curriculum. Torah exists in the heart of each individual as a living and vibrant truth, actualized by the choices he makes in the face of personal and private tribulation. Attempts to promote a particular ideology, modern Orthodox, haredi, or anything in between, will never bear fruit, for efforts to cite Torah sources to justify one’s ideological approach reduces the Torah to a supporting role, denuding it of its eternal message and power. For this reason, we cannot teach students to be Modern Orthodox, for even miracles from Heaven will not insure the loyalties of future generations. Only the deep inner commitment that comes with true clarity and inspiration can achieve this. Torah is light illuminating the darkness. The way of science is hypothesis; experimentation and proof, and yesterday’s theories are exposed to continuous reevaluation. If the Torah were taught in a similar way, with the need for evidence, instrumentality, and hope of reward, it, too, would be subject to reevaluation. But the Torah, when presented properly, cannot be rejected – for to reject Torah is to reject life, deny existence, and misrepresent the unity of G-d. Without minimizing the necessity or value of secular studies, students must appreciate and understand these differences. But when Torah subjects are lumped together with others in a cross-curriculum endeavor, the clarity and singular nature of Torah may be lost. Gedolei Yisrael have always been enveloped in an aura of peace and quiet, and visitors walk away awed and inspired, honored by a man who heeded the needs of each individual with dignity and respect, relating to each person as if he were an olam malei. In contrast, too often it seems that the highest position on the school totem pole is reserved for the C.E.O. of a major corporation, surrounded by secretaries and functionaries who prioritize his time. And an unfortunate outgrowth of this trend is the extra efforts extended to increase the school population, with an inordinate focus on quantity – forgetting all the while that G-d did not choose the Jewish people for their numbers. Students are not foolish. They sense and they perceive very clearly. If school leaders are concerned with organization, image and public relations, that attitude filters throughout the institution, and the students are the first to sense this lack of integrity. And when a school’s priorities are not the spiritual and moral development of each individual, but rather, the growth and health of the institution, students begin to look elsewhere for direction. To summarize: Our task is to build Torah Jews one by one. It may be a fond, unrealistic hope, but somehow we must see to it that the most influential figures in school are those who carry the name of Heaven on their lips, who are “holding in learning” and spreading Torah to their students. Ideally, this could well be the principal, and occasionally it can be a rebbe, but in no case should it be the builders, movers, shakers and moneymakers if they do not meet the rest of the specifications. We must be grateful to such people for their sincere efforts, but the model for the Jewish future must be a Torah personality. It also seems, at times, that an erroneous conception has crept into our communities, namely that ritual observance of the mitzvot is the sum total of G-d’s will, with nary a word about ameilut ba-Torah (total immersion in Torah) or avodat ha-Shem (serious service of G-d). When Torah study is not valued for its own sake, and our lessons are only for immediate and practical import, society loses sight of the Torah world. And when Orthodoxy is taught merely as rules for good living and a ticket to Heaven, it is little wonder that so many of our youth, who have more pressing concerns and more attractive alternatives, are not enthused by its message. Spiritual entities are one of a kind: harmonious and unitary. When Torah defines all of life, it is all-encompassing and for this reason the true Torah scholarship is holistic. A student attached to the Torah senses that Torah is his life and neither vanities nor pleasures will tempt him to leave it. For Torah education to succeed, we need not prove that the Torah has measurably better answers to the issues of the day. Instead, we need to demonstrate, by example, that the Torah reflects a different and more sublime reality. Our challenge is to inspire our children with the courage and tools to make the right choices. Whether they choose to be doctors, lawyers, kollel students or rabbis, makes little objective difference; by striving his utmost in the face of private difficulties, each and every Jew, in his distinctive set of circumstances, can successfully actualize G-d’s will in his own life. In this way, he becomes an integral part of the Jewish people, acquiring his own portion of Torah, and he will carry this message with pride on the road to eternity.